The Xperia ray boasts an 8 megapixel camera, complete with a single LED light. Much like the Arc, the ray uses an Exmor R backlit sensor, which promises improved low-light performance - we'll test that for ourselves. The camera controls on the Xperia ray are available on two taskbars on either side of the viewfinder. The left one holds five shortcuts to various settings, while the right one shows thumbnails of the five most recent photos. You can pull to expand the settings taskbars or push them out of sight. It’s a clever solution that lets you pick how much of the camera controls are seen in the viewfinder. The shortcuts in the left column can be rearranged and you can replace some of them with others from the extended menu. You can choose between three capture modes - Normal, Scene recognition or Smile detection. In Normal, you pick the Scene settings manually or you can enable Scene recognition and let the Xperia ray take a guess (it's fairly good at it). Other settings include changing the resolution, toggling between front/back camera, photo light (but it's switched manually, not automatically as a flash), geotagging, image stabilization and focus mode. Also at your disposal are a self-timer, shutter sound, exposure, white balance and metering settings. 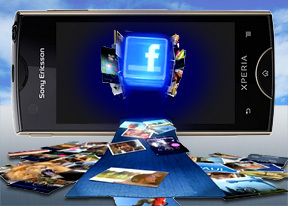 The Xperia ray handles the lack of a physical shutter key by making the entire viewfinder a virtual shutter key. You can press and hold to engage the autofocus. Touch focus is also available. The image quality is good - comparable to that of the Neo but not quite like the Arc. Noise levels are kept relatively low and photos have good contrast and colors. The amount of captured detail isn't among the best in the 8MP league however. Purple fringing and oversharpening are evident in high-contrast areas, but nothing drastic. Another downside of the camera is that it has a tendency to overexpose shots, especially when there are a lot of shadows in the shot. On the upside, the Xperia ray manages to keep some detail in those shadows. We also tested Sony Ericsson's claims regarding the Exmor R sensor. We snapped two photos in the dark, in poor lighting, with the Xperia ray and the Samsung Galaxy S II. The Xperia ray photos are clearly brighter, but with a lot of noise (which was to be expected). Tuning the S II photo brings up some detail in the dark areas but it's still marginally less than what the ray shows. Overall, the Xperia ray provides slightly better shots in the dark and is better at picking the proper settings for such a shot too (no need to manually edit the photos for one). We’ve also added the Sony Ericsson Xperia ray to our Photo Compare database. The tool’s page has a quick how to guide. The ray performs very well on the black on white lines of the first chart though the oversharpening is still easy to spot. The mostly flat grey of the second chart however brings out the noise - the grass and gravel squares fared quite well though, with reasonable amounts of detail left in them. The final chart shows good color rendering. The Sony Ericsson Xperia ray captures 720p video at 30 fps and does a good job of it. The camcorder has similar settings to the still camera - focus mode, metering, exposure value and image stabilization are user-configurable. The ray’s camcorder joins the select few with continuous autofocus. It may take a few seconds to refocus after you re-frame but that's better than repeating attempts to lock focus that may ruin a video. Videos are stored in MP4 format with an overall bitrate of about 6.2Mbps. Frame rate hovers at just under the 30fps mark and there are no duplicated frames. The amount of captured detail is on the low side however and there are jaggies on diagonal lines (the relatively low bitrate is at least partially to blame here). The specs for audio capture are much more pleasing - sound is recorded at 130Kbps in stereo 48KHz format, which is very good for the class (and even overall for droid video cams). If you want to look closer at the video quality, you can download this untouched sample 720p@30fps (12s, 9.4MB), taken straight off the device. We entered the Sony Ericsson Xperia ray in our Video Compare Tool database too and put it head to head with other 720p mobile camcorders. The relatively low bitrate doesn’t allow the Xperia ray to keep much detail in the videos - but the difference is less than we expected. Exposure adjustment is gradual too so it's not sudden or pulsating (and annoying) as in some other phones.